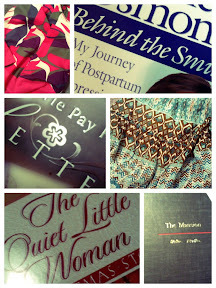 My best shopping - no matter how often I try conventional shopping - always ends up being in thrift stores. And usually I'm happiest if I don't think too much about what I'm buying. Brad and I hit up Deseret Industries Saturday. We actually had headed out of the house with another purpose, but took a detour to DI. The results: 4 books and 2 cute skirts. I'm a book hound. If I were stuck on a desert island I would be fine without make up, would enjoy foraging for food, and would do ok building a shelter. But I'd really, really, really want to have some books with me! Books would be the best thing on a desert island. I love thrift stores too. I buy books there too. I am obsessed with DI. In fact, when Gage wakes up, I think we're going to go look for more maternity clothes and some cute fabric for curtains. I love it!!! Our DI has a terrible book section though, it's tiny compared to yours. Neat picture collage - did you do that on instagram? Did the picture collage on an app called GridLens. Cool, huh! I agree -- I love reading and wish I had more time to devote to it. I now actually look forward to long plane trips because it means I can read for long stretches without worrying about my "to do" list. What a wonderful blog you have here and the inspiration for it. One of my colleagues' son had cancer and was undergoing treatment that caused his hair to fall out, so he kept his head shaved until his son's grew back. I'm a book lover too, and used book stores are one of favorite places in the world. I really appreciated you previous post on how to keep you cup full. All can say is, Amen. Finally, I'm so glad you found uplift and inspiration from my last post / link to Andy Andrews' presentation on the Butterfly Effect. It is my goal to keep future posts on Heavenly Minded & Earthly Good in the same vein. I love rummaging through thrift stores too...every now and then, you can find some pretty good stuff. and I'd have to agree with BOOKS, I love them. I'm an avid thrifter, too. It's so much more exciting shopping at thrift stores...you never know what you'll discover. Don't you just love DI?! I am so with you, I would rather shop at a thrift store most days, as a matter of fact I've been planning a trip there today.